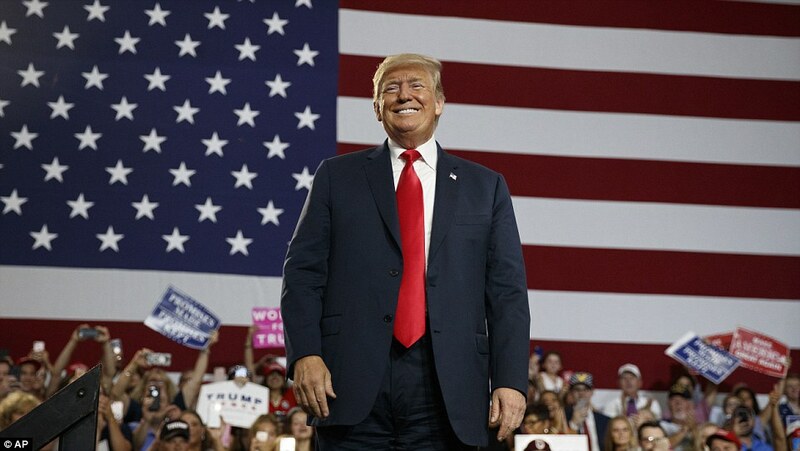 President Trump predicted a 'red wave' in the Midterm elections during a rally in Ohio on Saturday as he hailed positive economic growth figures and accused the Democrats of wanting to raise taxes and loosen immigration rules. 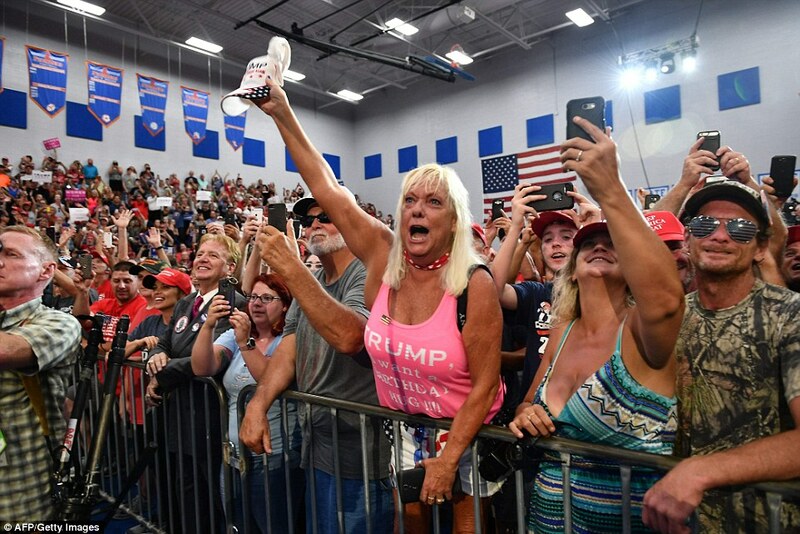 'Throughout a 120 years whoever has the White House tends to lose the Midterms,' Trump told the rowdy audience at Olentangy Orange High School in Lewis Center. Former White House communications director Hope Hicks made a surprise return to the spotlight to watch the typically rowdy address, which came four months after she left the White House. Trump spent much of the speech returning to his now-familiar riffs, with jabs at 'low-IQ' Maxine Waters and CNBC, which he called 'so corrupt and disgusting'. 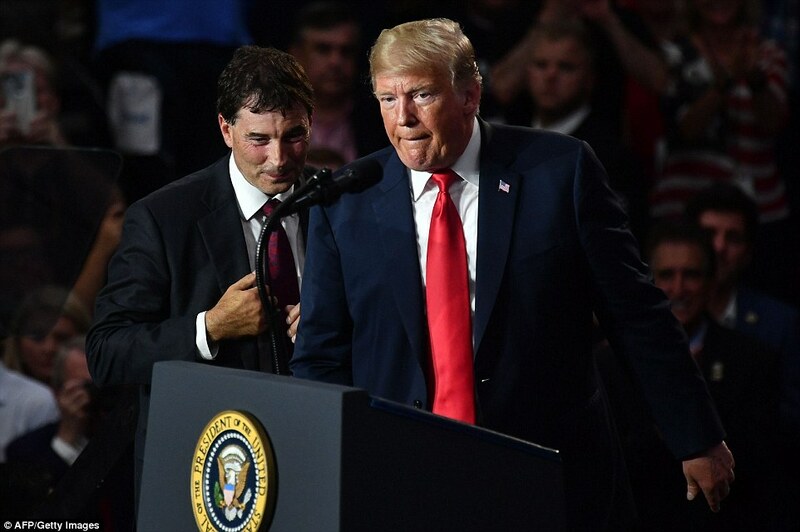 Trump was speaking in support of state Senator Troy Balderson, who is running in Tuesday's special election for an open congressional seat against Democrat Danny O'Connor. He urged Republican supporters to 'get out and vote' as he scoffed at predictions of a 'blue wave' in the Midterms and hit out at Democratic Rep. Waters, one of his favorite opponents. 'They're talking about this blue wave — I don't think so. I don't think so,' Trump said. Earlier, Trump was seen leaving Air Force One at John Glenn Columbus International Airport with Hicks among his entourage, in what was a surprise appearance from the former staffer. She resigned the role following a controversial appearance before the House Intelligence Committee during which she admitted to telling white lies on the job. Last month, she was seen out and about with her boyfriend Rob Porter, who stepped down as staff secretary to the President earlier this year in the wake of domestic abuse allegations made by his two ex-wives. During the rally, Trump praised Balderson as 'really smart' and accused his opponent Danny O'Connor of being an unknown and 'in the pocket' of Democratic Minority Leader Nancy Pelosi. Trump also brought to the stage Ohio congressman Jim Jordan, calling him 'a tough cookie'. The crowd chanted 'speaker of the House,' a reference to the possibility that Jordan will seek the speakership after November's midterm elections. He briefly referred to Senator John McCain, although not by name, when discussing about how difficult it was to get legislation passed with a Senate majority of just four. 'We have 'one vote' in the Senate who is 'not around to vote,' he said. 'I don't know. He's out. He's not voting.' The veteran Republican has terminal cancer. Sweltering temperatures inside the auditorium led to a sweaty Trump joking that his suit had been 'ruined' and quipping that the heat meant attending the rally was 'better than going to the gym,' he quipped. Lauding the progress of the American economy, Trump said four million jobs had been created during his presidency. He said he would have predicted such dramatic rises previously, but knew the 'fake news' would manipulate his comments. Trump then listed his favorite commentators, including Tucker Carlson, and said they were 'blowing away' their liberal rivals in the ratings figures because 'we love them'. Prior to the rally, a pastor gave a public prayer asking God to protect Trump from 'jungle journalism'. Trump slammed the 'elites' who predicted he would not win the election and lavished praise on the thousands of supporters gathered in the stifling auditorium. 'You are the smartest people,' he said. 'They talk about the elites. Did you ever see the elites? You are the elite. You are the elites. You are smarter than they are, you make bigger incomes. You have everything going. The typically rowdy audience reacted with delight as Trump repeated his familiar talking points. Praise for the enforcement officers of ICE prompted chants of 'build the wall'. And a mention of Supreme Court candidate Brett Kavanaugh led to screams of 'we want Kavanaugh'. Returning to another familiar point, Trump brought up the New York terror attack on Halloween last year as part of his argument for increasing restrictions on immigration. 'They talk about eight people dying but they never talk about the people who lost their arms and legs and will never be the same again,' he said. The appearance came just hours after Trump denounced Ohio's favorite native son, basketball superstar LeBron James, who just opened a school for underprivileged children there. He did not mention James during the speech. The president tweeted after an interview James did with CNN anchor Don Lemon that Lemon was 'the dumbest man on television' but that he 'made Lebron look smart, which isn't easy to do'. Pelosi, who would become speaker if the Democrats flip control of the House in November, has long been a Republican target. Truck driver and Trump supporter Rob LaPat said he was attending his first Trump rally. The 46-year-old said he liked the fact the economy is doing well and unemployment is down. A few dozen protesters lined along a walkway outside the school holding signs that say 'Impeach 45' and 'Real News Fake President'. A Monmouth University poll released this past week showed the central Ohio race tightening, leaving Republican Troy Balderson with just a 1-point edge. The survey found 46 percent of likely voters approved of Trump, while 49 percent disapproved.